Due to complaints of perceived weakness of the smallish eagle on the reverse, the US silver dollar adopted a large (often called “heraldic”) eagle reverse in 1798. The rising price of European silver in the earliest years of the 19th century made it profitable to ship US dollars overseas. Because of its relatively high silver content, a US dollar was worth more than one dollar in Europe. The dollars were melted, and then sent back to Philadelphia for re-coining, and the cycle repeated itself. Federal officials responded to this abuse by halting silver dollar production altogether in 1804. The US silver dollar did not appear again until 1836. The 1801 Draped Bust Large Eagle Silver Dollar is representative of the Heraldic Eagle type. All are rare and never bore collectors when the conversation arises. The history of the 1801 dollar reflects the difficulties of the early Mint and those of the fledgling United States. Yes, we have come a long way since then. 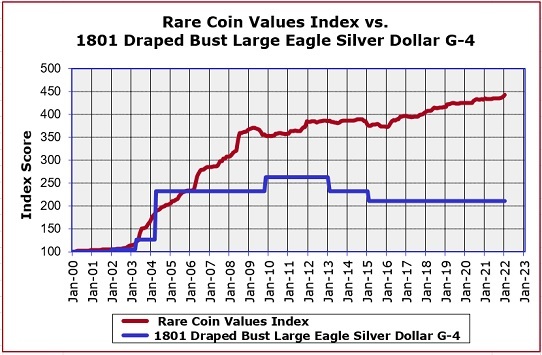 As the chart above illustrates, the 1801 Draped Bust Large Eagle Silver Dollar has more than doubled in value since Year 2000 (blue line). However, this still rates a little below the percent gain of our Rare Coin Values Index, which takes the composite percent change over time of a pre-selected group of 87 rare US coins, the purpose of which is to understand the strength and direction of the overall rare US coin market. The percent change in Index value is tracked by the red line, and as with the blue line, uses Year 2000 as the baseline. The 1801 silver dollar is one of the 87 coins that comprises the Index, which is updated monthly.